Unibio's process is proven, the technology patented and the finished product is uniform, long-lasting, non-GM and has EU approval. Wealth Club investors can co-invest with institutions and corporates in the latest funding round – individuals should have the benefit of EIS tax relief. There is already a pipeline of corporate and institutional investors and an IPO on AIM is planned, not guaranteed. 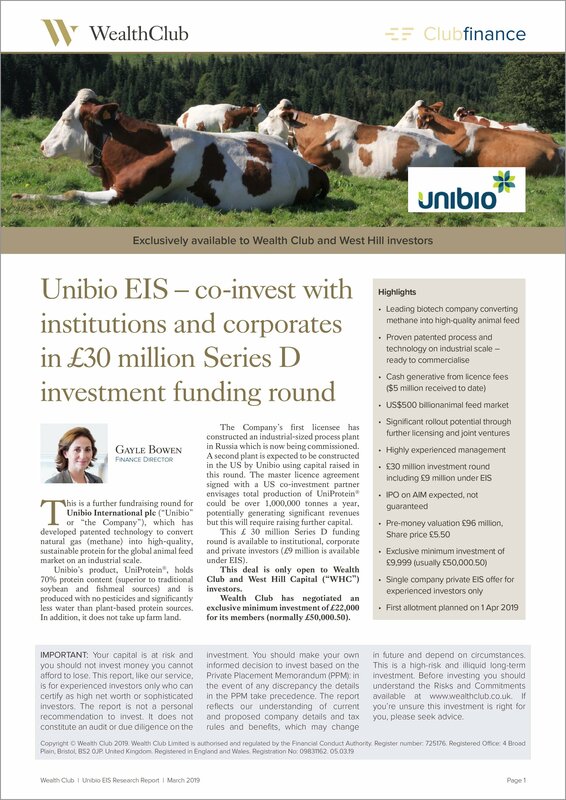 This is a further fundraising round for Unibio International plc (“Unibio” or “the Company”), which has developed patented technology to convert natural gas (methane) into high-quality, sustainable protein for the global animal feed market on an industrial scale. The concept underlying Unibio’s technology is simple: natural gas (methane) can be converted into a highly concentrated protein product, UniProtein®, which can be used as a direct supplement in feed for animals. It can substitute fishmeal, a traditional feed component and an increasingly scarce resource. UniProtein®, holds 70% protein content (superior to traditional soybean and fishmeal sources) and is produced with no pesticides and significantly less water than plant-based protein sources. In addition, it does not take up farmland. The Company’s first licensee has constructed an industrial-sized process plant in Russia which is now being commissioned. A second plant is expected to be constructed in the US by Unibio using capital raised in this round. The master licence agreement signed with a US co-investment partner envisages total production of UniProtein® could be over 1,000,000 tonnes a year, potentially generating significant revenues but this will require raising further capital. Unibio's ambition is to become the world market leader within protein production based on methanotrophic bacteria, partly by own production and partly by licensing the production technology to international investors wishing to establish large-scale production plants of UniProtein® using the surplus gas from oil production. The completion of the first commercial-size UniProtein® plant is a significant step towards this. Next, it plans to build its own industrial-scale plant in the US and expand globally. Long term, the Company has ambitions of entering the human food ingredients market. To fund its next stage of growth, Unibio is aiming to raise £30 million from private, corporate and institutional investors by issuing 5,454, 545 ordinary shares at £5.50 per share. £9 million is available under EIS. This deal is only open to Wealth Club and West Hill investors. Wealth Club has negotiated an exclusive minimum investment of £22,000 for its members (normally £50,000.50). 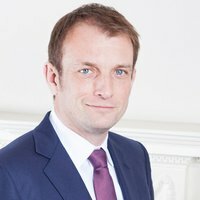 There is already a pipeline of corporate and institutional investors: Unibio has been negotiating with a number of corporate investors and investment funds including a UK-based agri-food company which is a subsidiary of a FTSE-100 constituent and an international finance institution established by the five Nordic countries to finance green investment projects. In addition, an IPO on AIM is planned, although not guaranteed. Video produced and published by Unibio in December 2017. The Company has been funded by raising £9.3 million in equity investments (of which c. £9 million under EIS) from private investors, £3 million in grants from the European Commission and the Danish Innovation Fund and a £0.8 million loan from the Danish Green Investment Fund. The Company’s most recent funding round was in 2017, when it raised a total of £5.3 million at a share price of £4.00. That offer, like the current one, was available through Wealth Club. At the time, we reported the Company was close to securing institutional funding. However, following lengthy discussions, the Company decided to delay that until further headway was made in the commercialisation of the business. The Company has made significant progress over the last two years, including the completion of the first commercial-size UniProtein® plant in Baltic Russia and the significant increase in non-binding letters of intent/orders from potential customers. As a result, the Company should now be well positioned to take matters forward with its US joint venture partner and to successfully attract new potential institutional and corporate investment at a higher share price – note as with all speculative ventures success is not guaranteed. There is no specified target return for this offer. However, the management's long-term aim is to build a $1 billion business. Should the Company achieve its milestones and successfully float on AIM, the reward for EIS could be significant. Please remember, though, there are no guarantees and your capital is at risk. Unibio’s highly experienced and skilled management team is lead by Henrik Busch-Larsen, CEO and currently the largest individual. Henrik holds a Master’s Degree in International Business Negotiations. He joined Unibio in 2009 and was appointed CEO of Unibio in March 2012 and Group CEO in March 2015. He is overseeing the international growth strategy and manages investor relations. Henrik is supported by a credible team who all have significant experience in the sector. Investors are investing in the company directly so will pay no direct initial or ongoing charges. West Hill will pay an introducer fee to Wealth Club of 2.3%. This is an opportunity for experienced investors to invest in a well-developed EIS-qualifying company with potential for global reach and scale opportunities. The animal feed market is significant and finding a sustainable source of protein is vitally important for food security. We are impressed with the progress made in Russia and hope to see the facility fulfilling orders later in the year. Whilst competition is increasing, the market is large enough to support more than one major player. If the corporate and institutional investments go as planned, this will be the final EIS funding round as the Company will exceed the £15 million gross assets level. This could therefore be the last opportunity to invest in this business whilst benefitting from EIS tax relief. We consider the Company has an exciting journey ahead although there are still major milestones to achieve before it meets its ambitious forecasts and success is not guaranteed: you should form your own view.